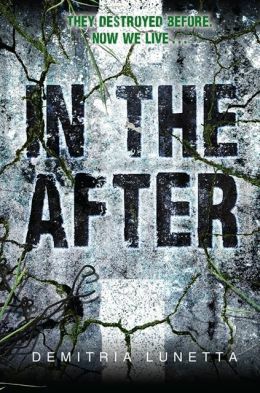 In The After by Demitria Lunetta is a superb debut. Fans of Rick Yancey’s The 5th Wave are sure to love this apocalyptic survivalist novel. Amy’s world completely changed the day They arrived. Both of her parents were out when Amy saw the story on the news. A spaceship had landed in a park. Vicious green creatures were now running rampant through the streets, consuming any human in their path in mere seconds. Lucky for Amy, her mother was a paranoid researcher for the government, so their house was incased in a tall electric fence. And her dad just so happened to be an environmentalist and had equipped the house with solar panels that kept the fence, and everything else in the house, running. After the days/weeks of self pity and wallowing, survival mode finally kicked in. With her food supply dwindling, Amy ventured out into the night (because the creatures are drawn to the light and can’t see in the dark) to pillage local food store’s canned good aisles, careful not to make any noise that would alert Them to her presence. For even though they have crappy sight, their hearing is superb, as is their speed when prey is within reach. One night, while on a food run, Amy found a toddler stuffing her face with rotten food in an old supermarket. Amy took her home and quickly discovered that the young girl (given the name Baby) had quickly adapted to making zero noise in the After. Together, the girls learned how to communicate through signs, and how to live and pillage in the After. After three years of surviving on their own, the girls are rescued and taken to a government research compound. This is where the novel transitions from “The Hunger Games” to “The Giver.” Everything is controlled and monitored. Everyone has a certain job, working together to create a fully functioning, self-sustaining, society. But with such strict rules, many freedoms are taken away. Can Amy blindly push aside her instincts and give complete trust to these “saviors”? Or is there something deeper at play? Heart pounding and thought provoking, I give In The After five stars. This book is definitely worth the read.